Another fun summer scarf but this time I used Cascade ultra pima cotton and oh….. it’s so soft and the sheen to the yarn is incredible. I’ve made a couple of things using this yarn with one being this jacket. It turned out fabulous too. You simply can’t go wrong using this yarn. Yarn – Cascade Ultra Pima Cotton or yarn of your choice. Approximately 170-200 yds. Gauge: Gauge is not really that important using this scarf. It’s very versatile to meet your desired length and width. Note: The stitching for the scarf uses some fpdc and bpdc which allows for some texture. 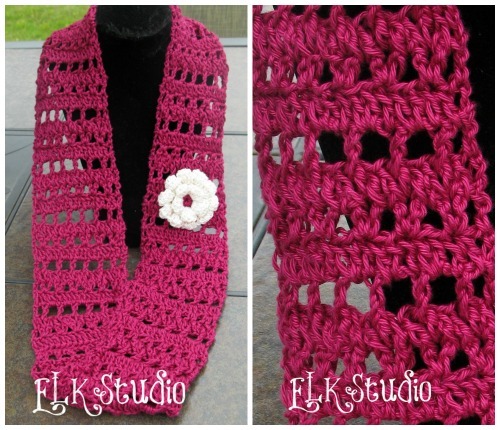 I realize that I used a large hook for the type of yarn but I wanted a very open and lacy type of scarf. If you want it tighter, just drop your hook size. Row 3: ch 3, *bpdc around the post of next dc, dc in next ch-1 sp, bpdc around the post of next dc;* repeat from *to* across ending with a dc in top of 3rd ch, turn. Row 5: ch 3, dc in next ch-1 sp, *dc in next dc, 2 dc in next ch-2 sp*, repeat from *to* across, ending with dc in top of 3rd ch. Repeat Rows 2-5 until reach desired length. If you recognize the flower from my Lacy Summer Scarf, you’d know that I used the same Dalhia flower pattern from My Hobby is Crochet. I love how dainty the flower is, and I really didn’t want something big to take away from the scarf. I think it’s the perfect size! Thank you, Kathy! Beautiful as usual! Thank you for including me! Hope you have a fantastic day!